You are trying to over-throw. Just relax and let the ball flow from your hand starting with: (1) collecting yourself (2) hip rotation (3) the push-off from the rubber (4) a smooth front-foot landing and (5) the follow-through of the hand to the plate. Imagine throwing your hand rather than the ball to the catcher. Where your hand goes so too will the ball. In fact, you should practice this strategy without the ball. Try doing it in front of a full-length mirror (just watch out for the mirror). Finally, try to avoid whipping your back-leg across your body as you will lose balance. Quality pitching is about controlling good mechanics. Just because someone throws hard doesn’t mean that they actually know what they are doing. 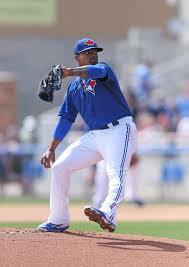 When you have your knee kick, attempt to bring your glove up with it, to create more separation and accuracy & velocity. It appears that when you work out of the windup, you work extremely fast. I also work out of the windup, but I suggest that you slow down a slight bit. I like your overall timing and rhythm. If I was instructing you, the one absolute technique I would tell you to work on is hip load and forward momentum during leg lift. You lack hip load and forward momentum during leg lift. This is a velocity killer. This action of leg lift, hip load, and forward momentum happens quickly in the first phase of the delivery (see picture below). You do not do this. You are a classic pitcher who lifts their leg straight up and drops their leg straight down without loading the hips and gaining momentum before hand break. At about the same point in the deliveries, you can see how Stroman is sitting into his delivery, moving his core down the mound. You are still gathered over your back leg. Once you start moving explosively towards the plate during leg lift and learn how to incorporate hip load, you will see a tic up in you velocity. Wow! Thank You. You just explained to me perfectly what coaches have been trying to tell me for years. Is there any specific movements and drills to do to reprogram my brain into doing this. I tend to do things a couple times in practice but then in games it goes back to the same old way unless I repeat the motion over and over. Yeah. Get next to a wall and practice falling forward from the leg kick into the wall. Do that to get the feel for it. I also believe (it may just be the angle) your stride can absolutely get longer. You have to start moving down the mound more explosively. On leg lift you have to load your hips and at the top of leg lift you should start moving your core down the mound. This movement will allow you to gain a longer stride without thinking about it. Work on the wall drill. This will help.